The partners of the PRIORITY project met in Germany, for the official project kick-off meeting. 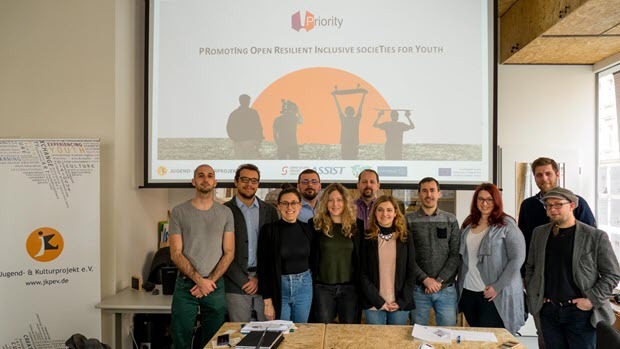 PRIORITY consortium is formed by 5 members representing youth organizations and networks, cultural and sports organizations, training centers, as well as private entities – Jugend- & Kulturprojekt e.V. – Germany, Centre for Creative Development “Danilo Dolci” – Italy, ASSIST Software – Romania, Mine Vaganti NGO – Italy, and The Center for Lifelong Learning KAINOTOMIA – Greece. PRIORITY is an innovative project that aims to increase the capacities of the organizations that work with youth to invest in prevention by removing breeding grounds for radicalisation and act as forces of inclusion, to empower young people from disadvantaged groups to engage, to participate democratically and drive positive change in communities, through the use innovative methods and practices coming from the combination of youth work, training, cultural mediation and sports fields. The event provided an insight into each partner’s point of view and expectations for the future development of the project, shape the agenda of the planned activities in order to meet all the challenges proposed.